As if slaughtering and eating pigs, cows, chicken, goats, lamb, tigers, dogs, deer, snakes etc was not enough, human(un)kind has decided to munch on scorpions and beetles now! 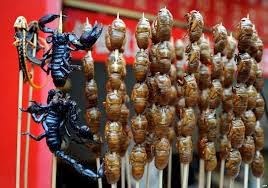 A tiny bar in Paris's Montmartre district has started offering scorpions and beetles to its customers to have a different taste and eating experience! Grasshoppers, beetles, scorpions and two different types of worm -- sango and silk -- are the latest additions to their fare. The chef says, "There are two textures.... you have the head and the body which are a completely different taste and flavor". The body was "sandy" tasting while the head was "crunchy" and tasted a bit like a combination of beetroot and mushrooms, he added! It's a wonder why people can't eat original beetroot and mushroom instead of killing innocent scorpions and beetles and eating them to have a taste of beetroot and mushroom! This is really outrageous! When will this madness of exploiting animal life and nature will stop? Humans are destroying everything on the planet in order to satisfy their greed and whims, without thinking about the repercussions it will have in the long run. We must understand that everything and every creature on the planet has a purpose and if we destroy them, we will destroy ourselves.